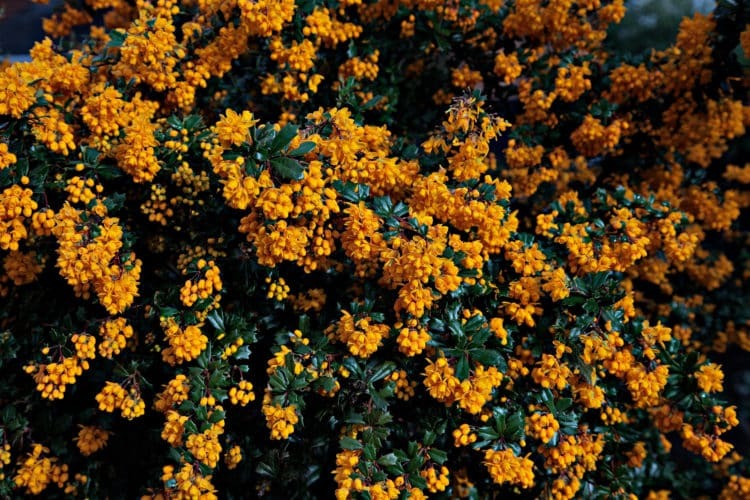 A great evergreen variety of Berberis making a dense and fairly fast growing prickly hedge, masses of rich orange flowers appear in late spring followed by edible barberries. The Berberis Darwinii (Evergreen Barberry) is a glorious hedge to help keep intruders at bay thanks to its prickly nature. It’s a fast growing, dense, evergreen hedge, first discovered by Charles Darwin in South America during his voyage of the Beagle. It produces stunning, bright orange flowers that are sweetly scented during the spring, before producing edible barberries in the autumn months, which are slightly acidic in taste. This versatile and hardy plant can be planted in most soils, especially chalk and clay. So long as the soil avoids waterlogged conditions and is easily drainable, then this plant will thrive. It much prefers to be planted in partial shade rather than full sunlight, and works great around coastal regions. They tend to grow in an upwards position and into a round shape, up to heights of ten feet. We would recommend to trim the Berberis Darwinni after it has flowered, so it can grow into a dense hedge. It grows on average one foot a year, and makes for a great boundary hedge and for maximum privacy, as its evergreen status means it won’t lose its leaves during winter. Plus it will provide you with extra protection with thanks to its thorny nature. When planting we’d suggest you leave a gap of eighteen inches to help provide you with a dense impassable boundary. For any further advice or recommendations feel free to contact our dedicated members of staff, who will be happy to help.